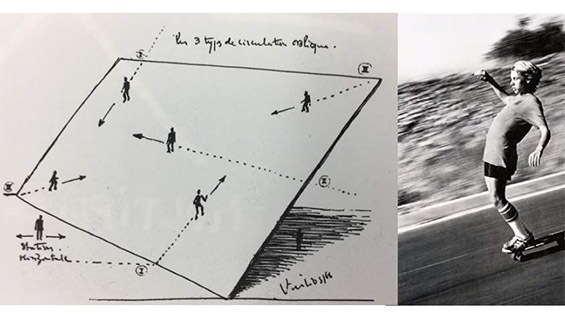 From Jose Luis Mateluna's proposal, Skating Oblique: Paul Virilio’s diagram “Les 3 types de circulation oblique” and skateboard legend Jay Adams 1970. Circulation Habitable, Architecture Principe 1966 et 1996 (Paul Virilio & Claude Parent, 1996). Jay Adams going Downhill, photography by Craig Stecyk. 1970. This week, six graduate architecture students from The Cooper Union will travel to Milwaukee to deliver papers at the annual conference of the Association of Collegiate Schools of Architecture (ACSA), a competitive conference dedicated to architecture history, theory, and education. “They’ll be presenting at a conference only a month after completing their studies,” Associate Dean Elizabeth O’Donnell pointed out. Last spring the students took a proseminar called Play-Writing Architecture (Or Architectus Ludens, aka Architect the Player) taught by Tamar Zinguer, associate professor in the Irwin S. Chanin School of Architecture. Professor Zinguer, who wrote about architectural toys in her 2015 book Architecture in Play and is currently writing a history of the sandbox, designed her course to introduce students to theories of play, including those by Walter Benjamin, Johan Huizinga, and Roger Caillois. In addition to reading the work of such influential critics, she set out to help students refine their writing skills, which Professor Lauren Kogod had focused on the previous semester with the group. "Play is universal and based on tacit knowledge," Professor Zinguer says, and it's a useful concept for designers: while play may be based in fantasy, it has rules that must be adhered to. Students get to eschew physical and technological limitations while still being bound by an internal logic. A bit of professional serendipity further shaped the course: the Fall 2018 ACSA conference is titled “Play with the Rules.” According to the ACSA organizers, the conference sets out to respond to architecture’s many constraints including location, budget, building codes, and program. In their abstract they asked, “How can these parameters be mobilized to ends that rethink the role of rules in architecture? Can rules be a form of play?” To underscore the theme, they named their sessions after well- known board games (Clue, Risk, and Candyland, to name a few) and called each session facilitator a “disrupter.” Professor Zinguer herself will be a "disrupter" for four different sessions at ASCA this year. When she learned about the conference, Professor Zinguer saw an opportunity for her graduate students: they could use what they learned in her course about theories of play to craft their own paper proposals for the ACSA sessions. Astoundingly, six of the nine proposals were accepted for presentation at the conference. One student, Farnoosh Farmer, proposed a paper about the use of convex and concave mirrors in art and literature, noting that an outward curvature creates a reflection that places the viewer at the center and all else becomes peripheral, while an inward one creates lengthened, panoramic views. “The space between reality and reflection is a playful one,” she said on a recent afternoon while taking a break from hanging her thesis show. “I’m always interested in the relationship between utopia and dystopia. Some of the paintings I discuss in my paper were done at a time when such mirrors were unusual and a marvel.” In “Las Meninas,” Velasquez, for instance, conflates the picture plane, the mirrored reflection, and the viewer’s perception of the scene. Samriddhi Sharma is presenting on two 20th century artists, Isamu Noguchi and Gonzalo Fonseca, comparing Noguchi's playgrounds to Fonseca's sculptures. 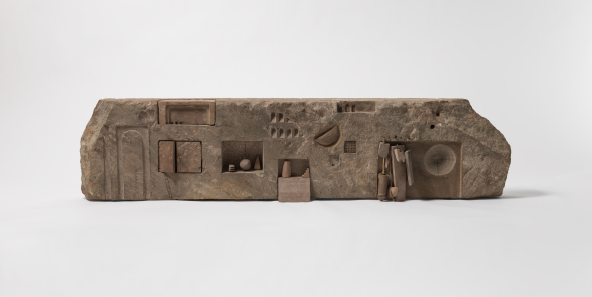 "Their friendship fostered a new understanding of sculpture," she wrote in her proposal, "which went beyond object making into observing them as a microcosmic way to understand play." While Farnoosh and Samriddhi used play as a concept to understand representations of space, several of their colleagues, examined play on an urban scale. Analyzing Aldo Rossi’s Teatro del Mondo (1979), Shang Wei Lin finds Venice—where Rossi's theater was alternately moored and floated on the Grand Canal—to function much the way the mirror did in "Las Meninas," as a vehicle for distortion and unexpected possibility. “Is Venice….the real Situationist city?” he wonders, referring to the 1960s French thinkers who saw random movement through the city as a way to claim space. José Luis Mateluna, a student from Chile who previously worked for Kenzo Kuma, takes the Situationist conceit and puts it on wheels by proposing that the skateboarder, not the flaneur, could be the standard of measurement for designers. “It’s an invitation to not be static,” he said. For his paper, José considers the work of architect Claude Parent—whose buildings forego right angles in favor of oblique angles and curves—in light of a public space in Philadelphia functionally transformed by skateboarders despite the wishes of city planners. Shantanu Bhalla decided to use play as a lens for analyzing architectural education by drawing on the ideas of D. W. Winnicott, whose essay “The Location of Cultural Experience” (1967) was read during the course. Winnicott developed a concept of “potential space” to mean a psychological state in which a person feels both connected to reality and enabled to imagine an alternative, i.e., to take a playful stance. 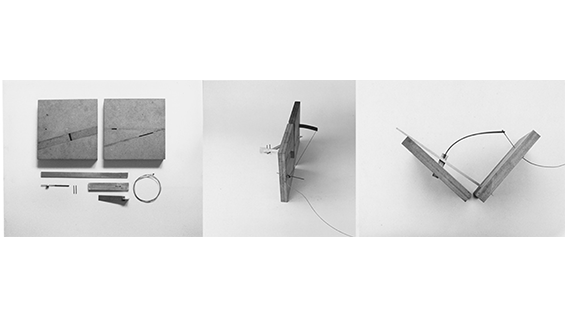 In 1971, Winnicott wrote, “For me, playing leads on naturally to cultural experience and indeed forms its foundation.” Using that idea as an analytic framework, Shantanu mined Cooper’s architecture archives to analyze Elizabeth Diller’s tectonics course, which the Cooper graduate taught from 1983 to 1985. Students noted their excitement about preparing a conference proposal and presenting in Milwaukee. While mounting her thesis show at the Houghton Gallery a few weeks ago, Samriddhi said, "You have to articulate your ideas as clearly as possible for a proposal, and that's the best way to synthesize what you learned during the semester." When the group returns, they’ll be sharing their photos from the conference, which we’ll feature in an image gallery on this web site.